Azurite crystals are monoclinic, and when large enough to be seen they appear as dark blue prismatic crystals. Azurite specimens are typically massive to nodular, and are often stalactitic in form. Specimens tend to lighten in color over time due to weathering of the specimen surface into malachite. Azurite is soft, with a Mohs hardness of only 3.5 to 4. The specific gravity of azurite is 3.77 to 3.89. 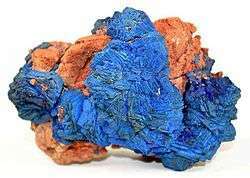 Azurite is destroyed by heat, losing carbon dioxide and water to form black, powdery copper(II) oxide. Characteristic of a carbonate, specimens effervesce upon treatment with hydrochloric acid. The optical properties (color, intensity) of minerals such as azurite and malachite are explained in the context of conventional electronic spectroscopy of coordination complexes. Relatively detailed descriptions are provided by ligand field theory. Azurite was used as a blue pigment since antiquity. Azurite is naturally occurring in Sinai and the Eastern Desert of Egypt. It was reported by F. C. J. Spurrell (1895) in the following examples; a shell used as a pallet in a Fourth Dynasty (2613 to 2494 BCE) context in Meidum, a cloth over the face of a Fifth Dynasty (2494 to 2345 BCE) mummy also at Meidum and a number of Eighteenth Dynasty (1543–1292 BCE) wall paintings. Depending on the degree of fineness to which it was ground, and its basic content of copper carbonate, it gave a wide range of blues. It has been known as mountain blue or Armenian stone, in addition it was formerly known as Azurro Della Magna (from Italian). When mixed with oil it turns slightly green. When mixed with egg yolk it turns green-grey. 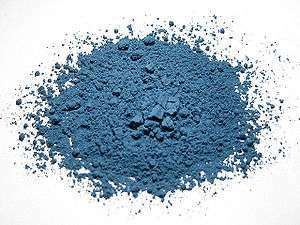 It is also known by the names blue bice and blue verditer, though verditer usually refers to a pigment made by chemical process. Older examples of azurite pigment may show a more greenish tint due to weathering into malachite. Much azurite was mislabeled lapis lazuli, a term applied to many blue pigments. 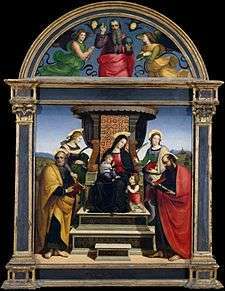 As chemical analysis of paintings from the Middle Ages improves, azurite is being recognized as a major source of the blues used by medieval painters. True lapis lazuli was chiefly supplied from Afghanistan during the Middle Ages while azurite was a common mineral in Europe at the time. Sizable deposits were found near Lyons, France. It was mined since the 12th century in Saxony, in the silver mines located there. Heating can be used to distinguish azurite from purified natural ultramarine blue, a similar but much more expensive pigment, as described by Cennino D'Andrea Cennini. Ultramarine withstands heat, but azurite turns to black copper oxide. However, gentle heating of azurite produces a deep blue pigment used in Japanese painting techniques. ↑ The Ancient Library: Smith, Dictionary of Greek and Roman Antiquities, p.321, right col., under BLUE Archived December 20, 2005, at the Wayback Machine. ↑ Nicholson, Paul; Shaw, Ian (2000). Ancient Egyptian Materials and Technology. Cambridge University Press. ISBN 978-0521452571. "Azurite". Encyclopædia Britannica. 3 (11th ed.). 1911. p. 86.